As it’s winter break, I decided to go to the library and check out art books for inspiration for the upcoming semester. A bright yellow spine caught my attention. I grabbed it out of its cozy spot, and flipped through to see what it may be about. Immediately I saw photos of legos and illustrations, and I was hooked. 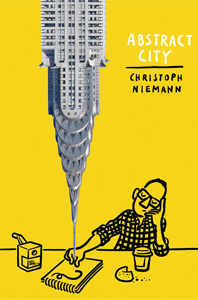 That is how I came across Christoph Niemann’s Abstract City. First I have to say that this book is utterly hilarious; I literally had a smile on my face and I really did “LOL” at times. The illustrations and comments are witty and refreshing, and I absolutely adore the design of the book. Its end pages flow seamlessly and there are even fly-out pages, which make the book, in my opinion, more fun and a bit interactive to read. Despite many references about New York, I think non-New Yorkers can find enjoyment amongst the colorful artwork. If there is any kind of talent I would consider relevant, it would be natural enthusiasm, which keeps you going despite the difficulties and frustrations that are inevitably part of creative work. Reading that sentence—or rather the whole chapter/visual essay (titled: Afterward)—gave me a boost of motivation. It was exactly what I needed to hear/read after previously having a somewhat rough semester. I hope anyone who is struggling with the creative process will find Niemann’s words to be of encouragement. You can check out more of his work at New York Times and his website.